Pomegranate Pear Salad with Walnuts is loaded with flavors and would be a delicious addition to your Holiday dinner table! A vibrant salad full of different textures that is easy to whip up and makes every dinner special. 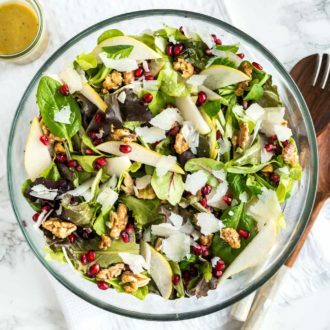 In a large bowl combine baby greens, caramelized walnuts, thinly sliced pears, parmesan cheese (or blue cheese), and pomegranate seeds. In a small bowl, mason jar, or dressing shaker, combine the vinegar, honey, mustard, olive oil, salt, and pepper. Whisk/shake until the dressing is smooth. Just before serving, add the dressing to the salad and toss until everything is evenly coated. Serve immediately!